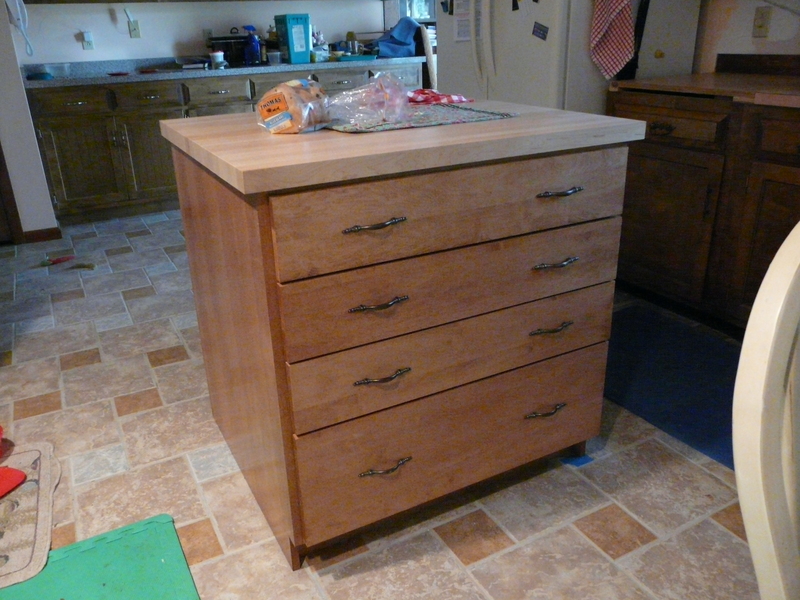 Did I mention the island with its butcher block top, electrical outlets and four enormous drawers? And it’s approved by Flo. 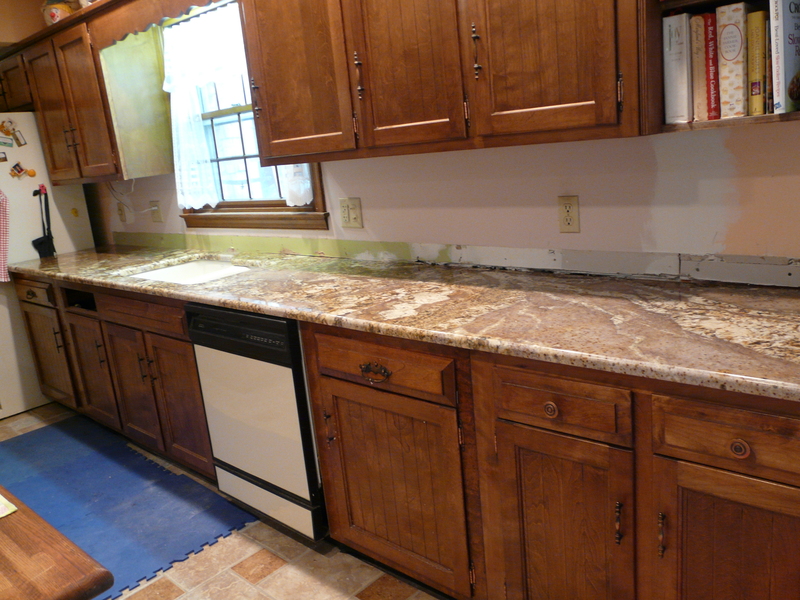 No range hood yet. It’s too hot in the attic to lay in the electric. We could paint, but who wants to do that. The weather has been really lovely for about a week and we haven’t had the air conditioning on. Sweetums bought a new window fan, but it doesn’t fit in the window. Frank to the rescue? Well, not quite. He has a couple of other things that he has to do first. But he did stop by and knows what needs to be done. Why can’t I sew? 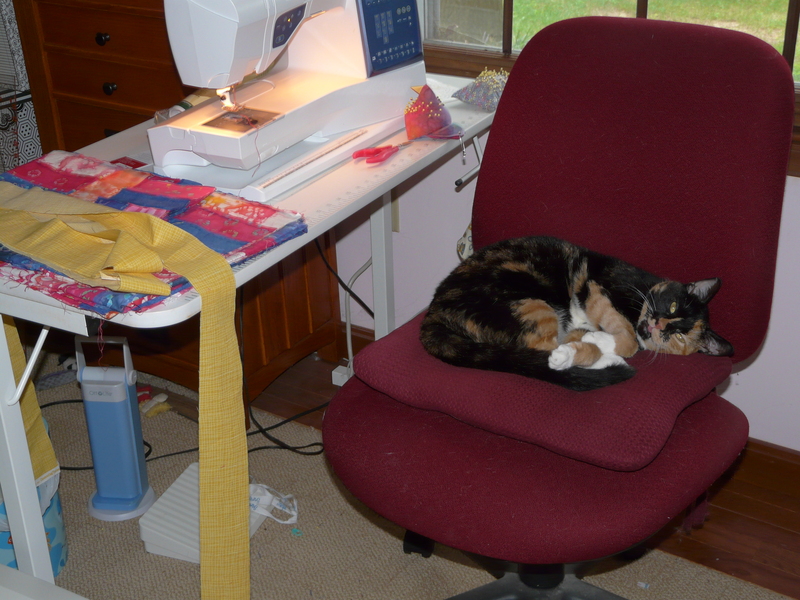 My sewing table sits near said window. So my table went one way and my machine went another until the fan is installed. I am so glad that I can knit. Speaking of knitting, here is my latest project. I saw this yarn at Frivolous Fibers last week and had to have it. Janet said she spun it herself. Even better. 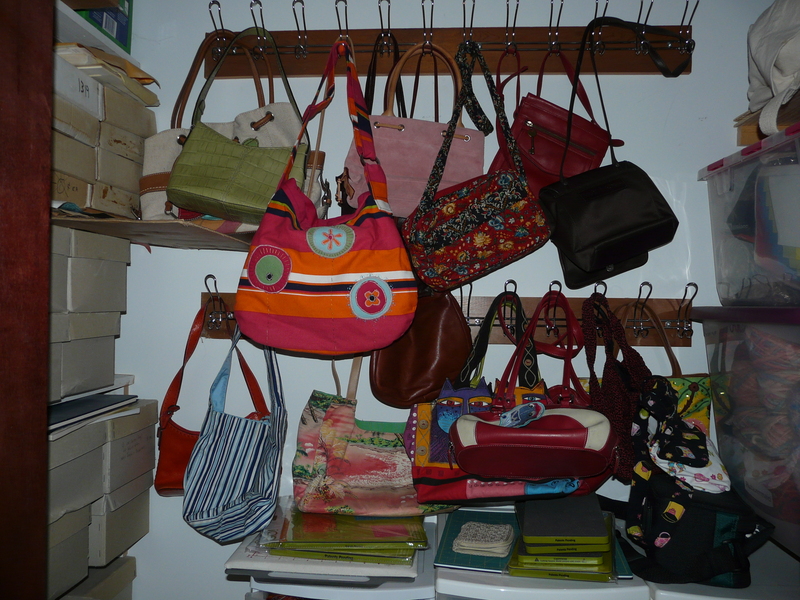 I think I spent most of a day pouring over my books and internet looking for the right pattern. 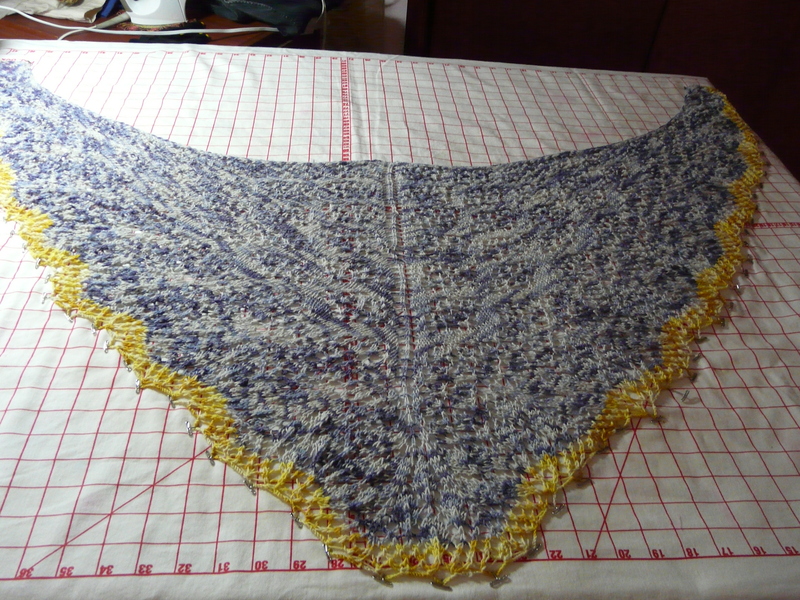 Coquille shawl in Knitty seemed to fill the bill. An unusual shawl for an unusual yarn. The pattern knits up quickly and it’s easy to see just what row you are on. I seldom need to look at the directions. Last Tuesday, the “girls” and I went on a field trip. First stop was a quilt shop in Easton where Maria, as usual, couldn’t make up her mind. Then we had lunch at Sam’s in St. Michael’s. And finished with the yarn shop there. And, again, Maria couldn’t make up her mind. PS– I want to apologize for the ranting last time. I guess I just expect someone twenty years younger than me who is working to have computer skills. Posted in Family and Friends, Knitting, Sewing | Comments Off on I Can’t Sew! 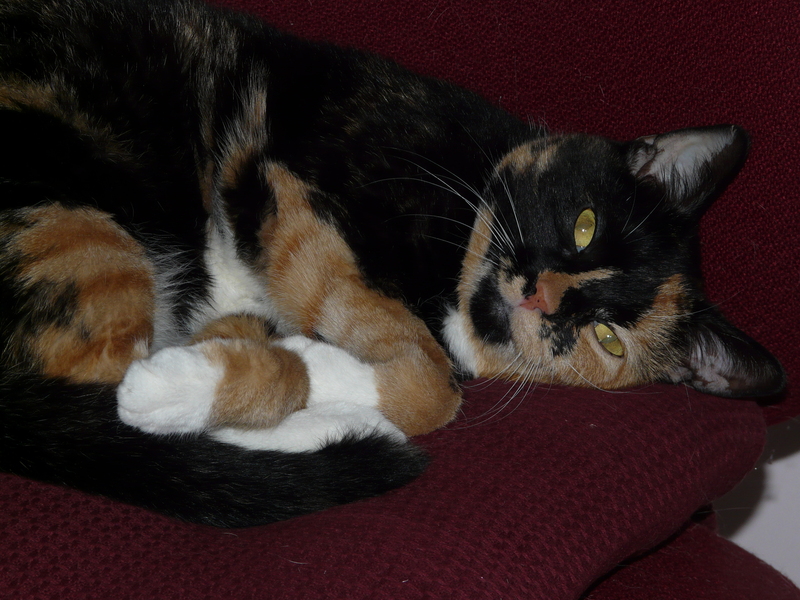 After several days of running around, I’m glad to be home, doing nothing much. I knit a little. I cut some squares for the back of my quilt. I read. And I didn’t have to be nice to anyone. Tuesday, it was easy to be nice to everyone. 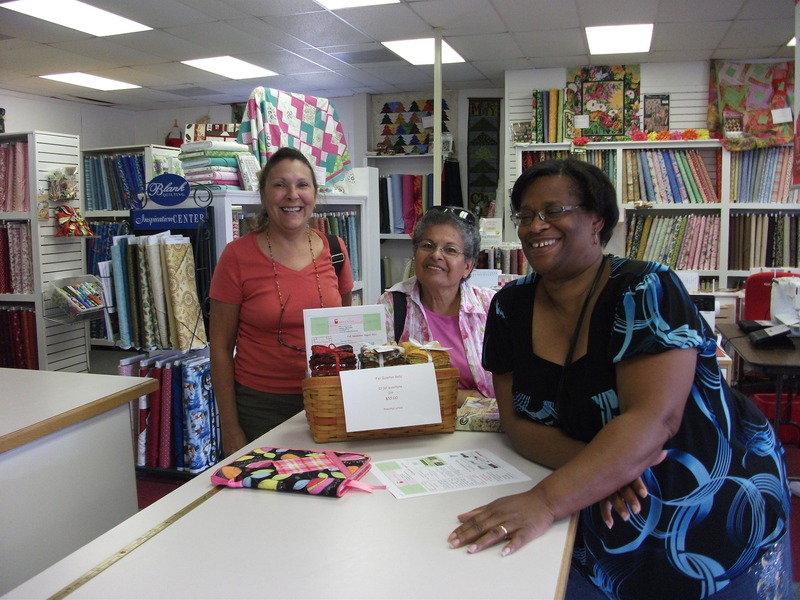 I was out with some girlfriends shopping at quilt and yarn stores. We had a great time. Yesterday was a lot harder. Sweetums had to go to the coumadin clinic. The nurse has no math or computer skills. Logical thinking is completely beyond her. She obviously has been shown one way to enter data and knows her head would explode if she touched any other keys. Her answers to any of our questions might as well be, “Because I said so”, for all the good they do. We get much information on our own. I think she would be much happier if we just said the appropriate yes or no to her mundane questions, took her printout, and left. You know, like warm brown turds. Later, we went to see the lung doctor. 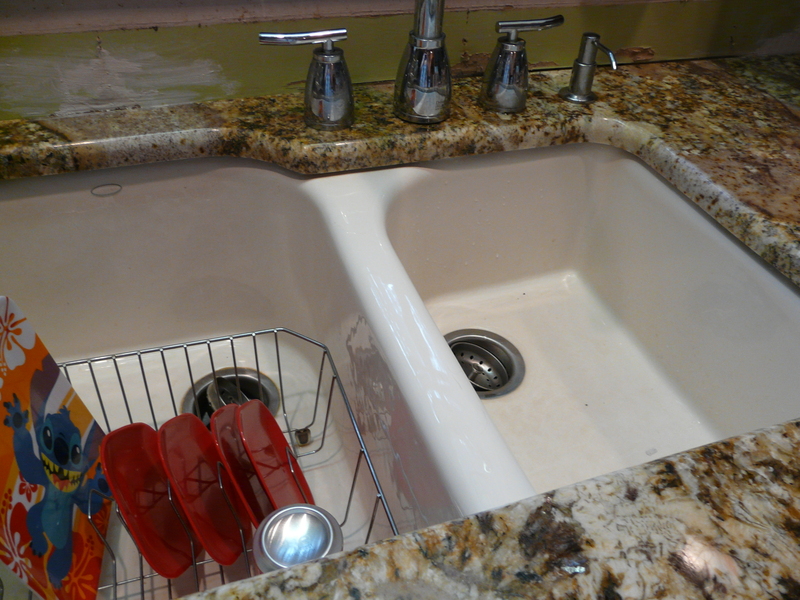 What should have taken fifteen minutes, went on for an hour and a half. To begin, their appointments were messed up. The two people who were there did not seem to be listed. So why did we have to wait? When we finally saw the doctor, he had to show us the echo and explain every little detail. Been there. Done that. Then he basically wrote his report while we were sitting there. Talk about bored to tears. I am so glad I always bring my knitting to these things. How does Sweetums manage to stay awake through these things? But, then, that’s just another reason why I call him Sweetums. This was the Socks That Rock sock club. I didn’t like the sock pattern at all. I could hardly see the pattern on the finished sock. So I tried the shawl. It started out all right, but I just didn’t like the look of the waves. So I took them out and ‘kind of’ followed the lace work. 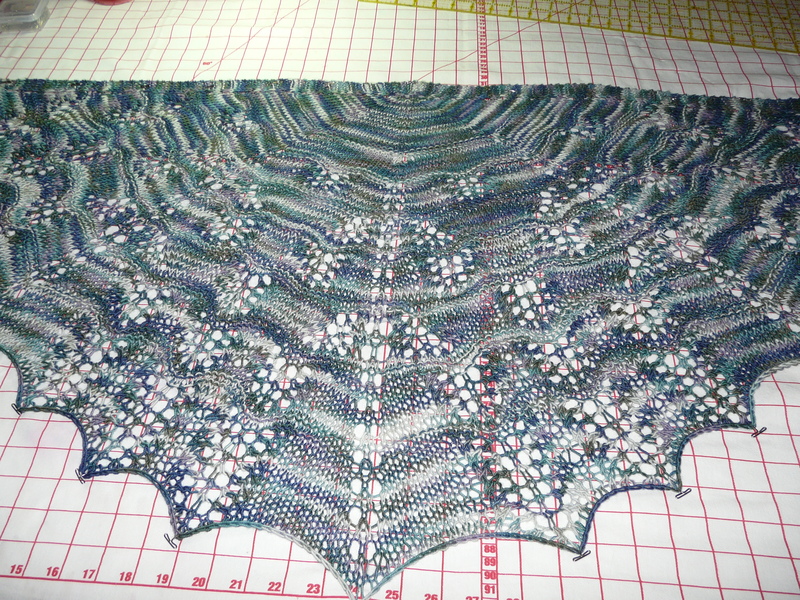 Here it is on the blocking table. It is pretty. Too bad I don’t care for shawls. Why do I even make shawls? I never wear them. Maybe I’ll give it to my girlfriend for the bazaar. I am so glad that I decided to go my way with this one. It’s been fun figuring out how much of each color I would need for each section. I finished the main part, but yellow seemed to be the color I needed for the borders. I didn’t find any in my stash so I went internet shopping. I bought one yard each of three different yellows that I thought would work. 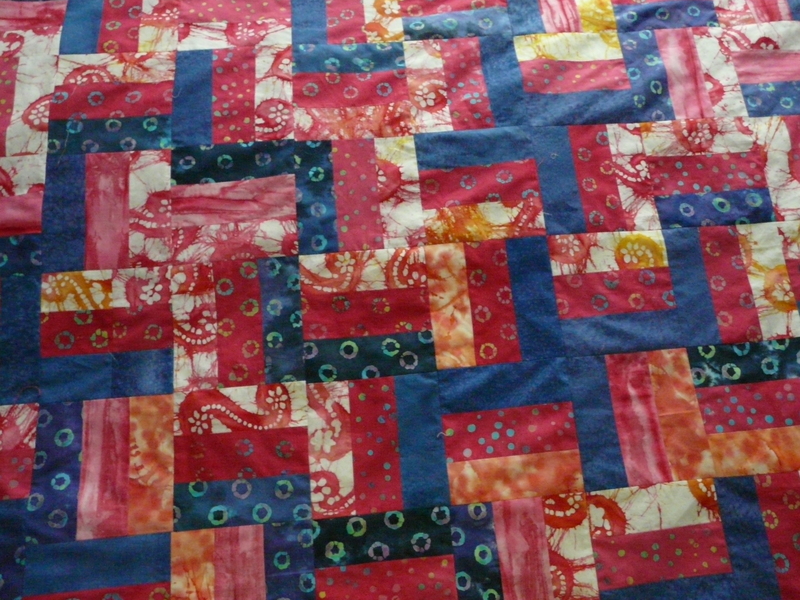 I laid each one over the quilt and they all work. Happy dance. I picked the pale one for the borders. But, I haven’t been able to work on it as much as I would like. What do you do when your cat looks up at you and smiles? Maria’s church is trying to raise money for a new roof. They are going to have a bazaar in the Fall. What a great excuse to make something fun! I had the perfect yarn, an acrylic/wool blend that will be easy to wash. 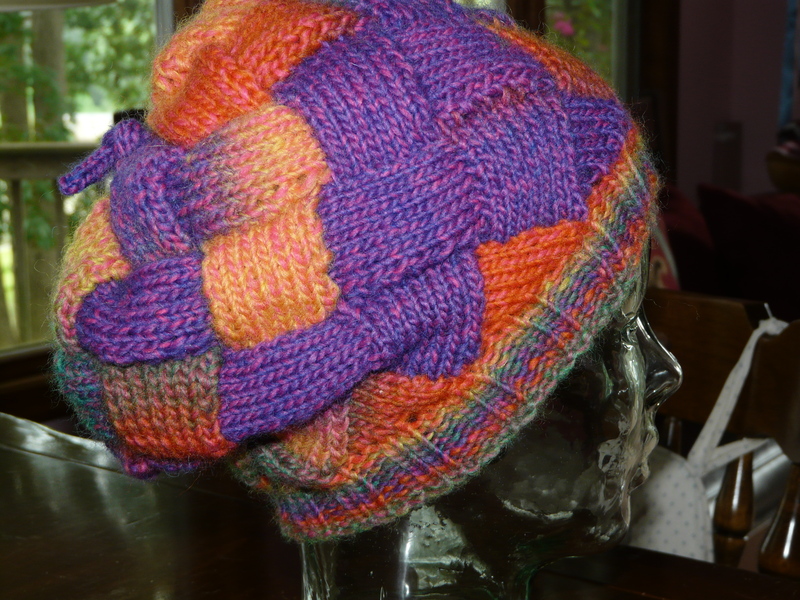 I started with an entrelac hat. For some reason, I made an extra tier of squares. 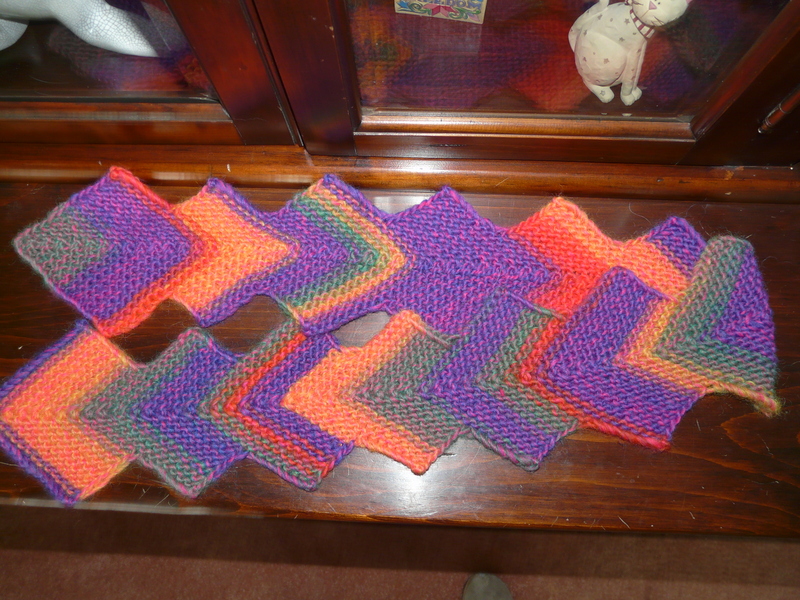 Then I had to knit the decrease tier in the opposite direction. I found myself picking up the wrong side more than once. Maybe I should have taken the extra tier out, but I’m I didn’t. It really looks good on. 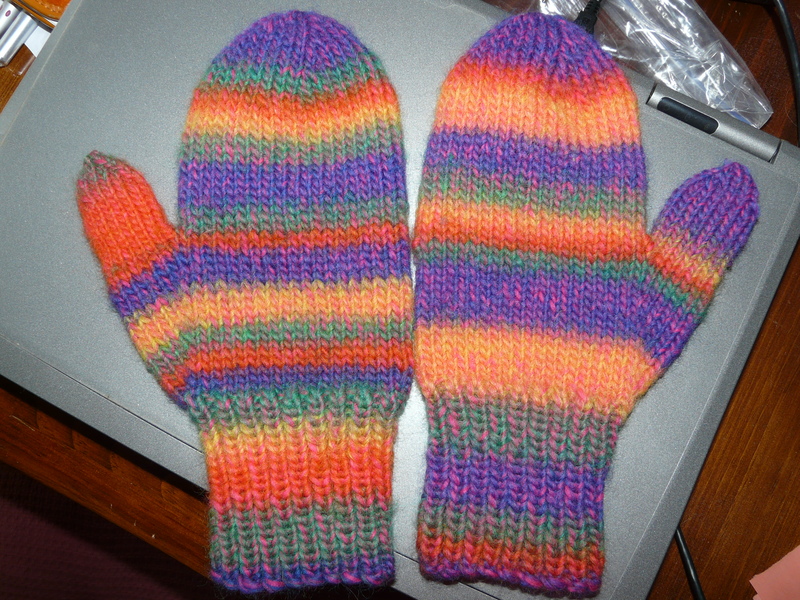 Next, I decided to make mittens. I really like them. It’s a good thing I made them a little big. These are definitely feel good mittens. Just looking at them makes me smile. I had a little over one skein left at this point. Do I keep what’s left? Nah. So I made a little scarf. It’s only about four feet long, but it’s still long enough to keep a neck warm. 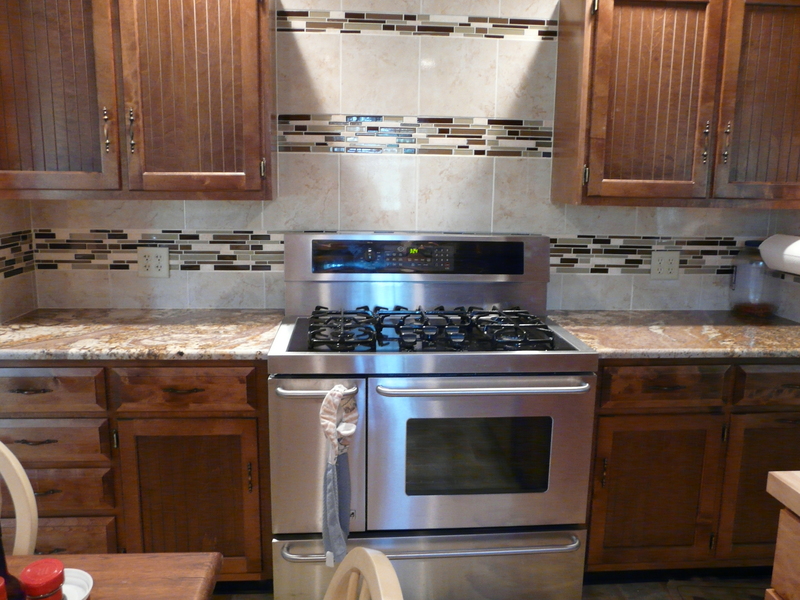 And mitered squares are so much fun. How Did I Become this Organized? I’m not a ‘place for everything and everything in its place’ kind of person. It’s all Sweetums’ fault. He keeps creating places to put stuff and actually puts stuff in them for me. It’s scary. If he brings home a coffin, should I run? Posted in Stuff | Comments Off on How Did I Become this Organized? He called to say he was taking Friday off. He had a few things to do and would be here around 4PM. The bay bridge gets backed-up with weekend ocean goers. (Is that a word?) Luckily, he was over before it got bad. 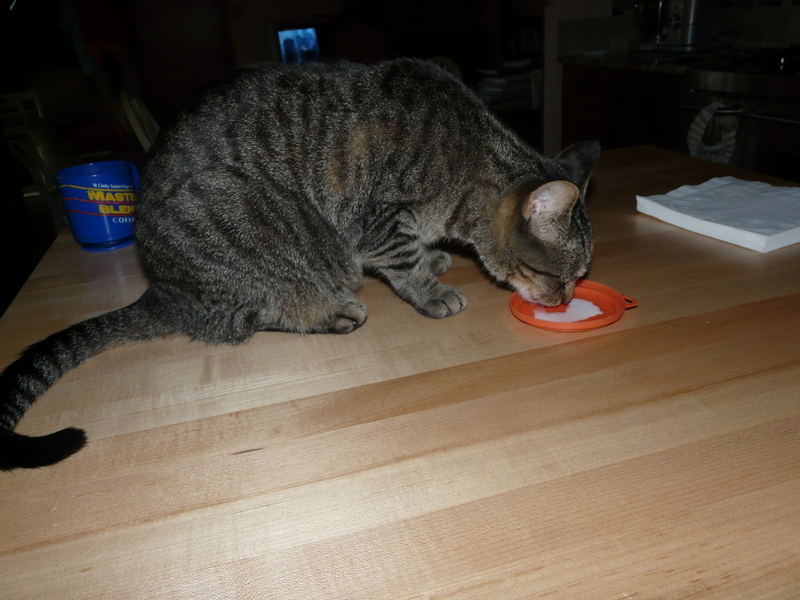 I got out the crab meat and corn I had frozen when Sweetums was sick and had no appetite. A neighbor had given us about a dozen ears of corn, most of which I had to freeze. The crabcakes I made were still pretty good and so was the corn. I felt better. I don’t like freezing fresh food. I only buy what I think I will use in a week. 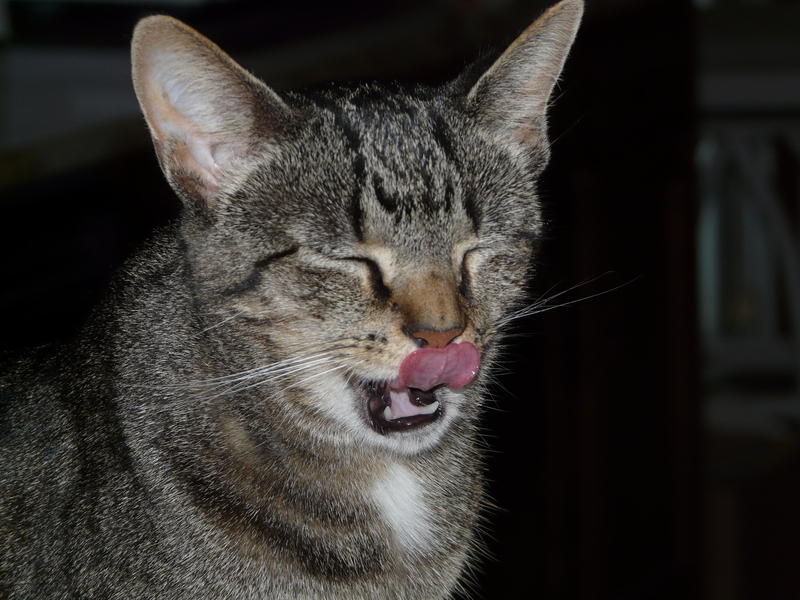 Fresh tastes so much better. 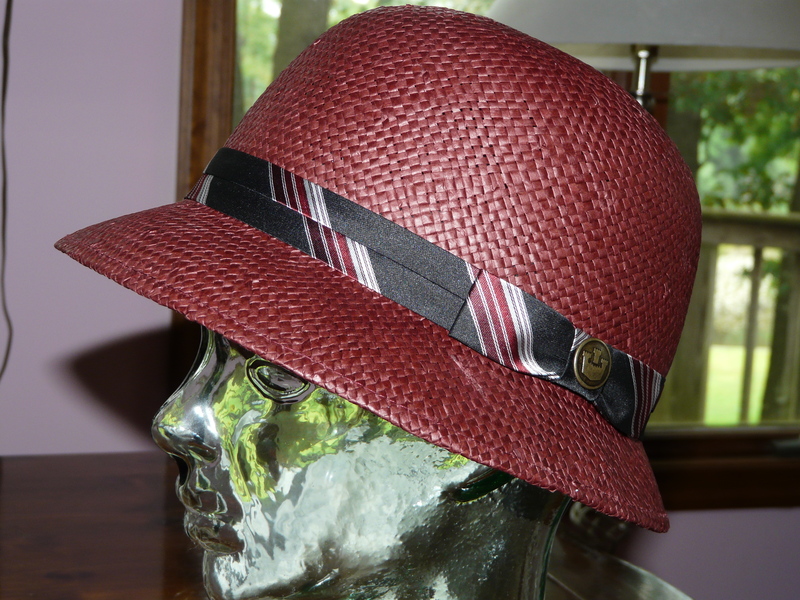 My son brought me this beautiful straw hat. He got it from Goorins. I haven’t worn it yet. I don’t want to sweat on it. It’s too nice. I was surprised at how quickly I finished this shawl. My loops don’t look as good as the picture. It could be my crocheting or it could be my blocking. If I cared more about the loops I probably would have done a better job of it. 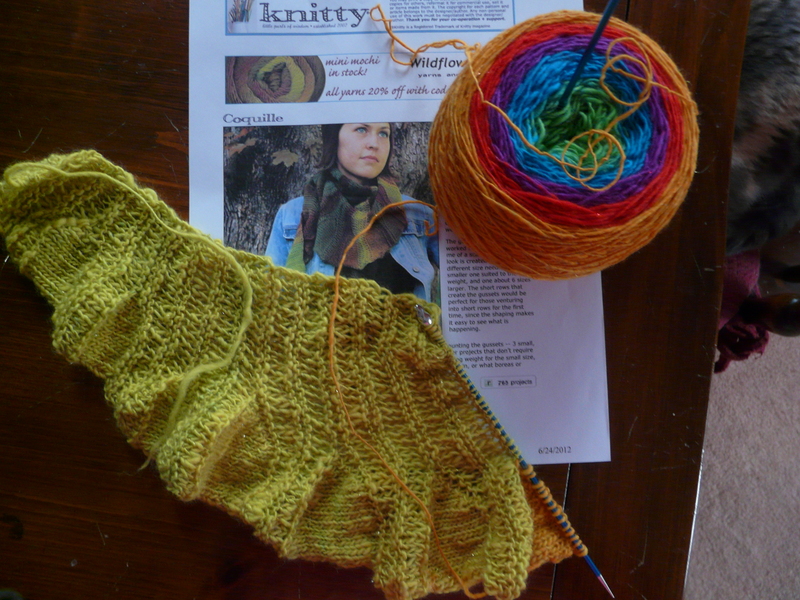 I am so glad I found the leftover yellow and finished the shawl with it. I’m not really a blue person and adding the yellow really made me feel better. This shawl is going to someone who I do not know. I hope she likes it.